To bring awareness to National Infertility Awareness Week (NIAW) and infertility in general, I decided to do a blog post focusing on our struggles. 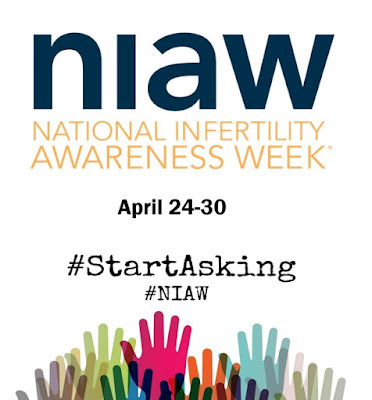 NIAW is April 24 - April 30 and its purpose is to bring awareness to the disease of infertility. 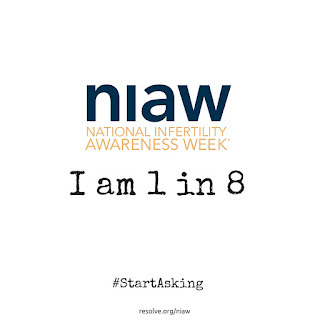 Infertility affects 1 in 8 couples and is usually defined by not being able to conceive after 12 months unless there is a known medical condition. In our case, it's because I have PCOS, another issue that needs more awareness and you can read more about it in a previous post I did. At the moment we are waiting for my husband's test results and for my next cycle to start in order to do a hysterosalpingogram (HSG), but hopefully, there aren't any other complications and I can start taking Clomid (a fertility drug that is used to help with ovulation). We are almost at 9 months now without any success, but I have heard plenty of success stories from women who have PCOS and/or have used Clomid and am hoping we will have the same results. We are just trying to take everything one step at a time now. There's nothing we can really do and it's kind of tough to just accept that it is what is is. We have discussed a little bit about how far we are willing to go since cost becomes an issue, but at the same time, we aren't even sure since we don't really have to or want to worry about that right now. 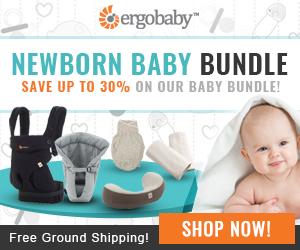 To all those struggling with infertility, just know you are not alone. To those with friends or family struggling, I highly recommend reading the Infertility Etiquette posted on Resolve's website. Family and friends often think they are helping, but in reality, they can be saying some pretty hurtful things. It's time to educate yourself on infertility and learn to be more sensitive to the loved ones in your life that are struggling to conceive. I also want to bring up the question "When are you having kids?" again, which I discussed in a previous blog post. Now that we have actually been struggling and have been asked during the process (granted at the time those family members didn't know we were trying and probably thought it was an innocent question), this question has become less annoying and more hurtful, so I want to say once more that it is NEVER okay to ask this question. 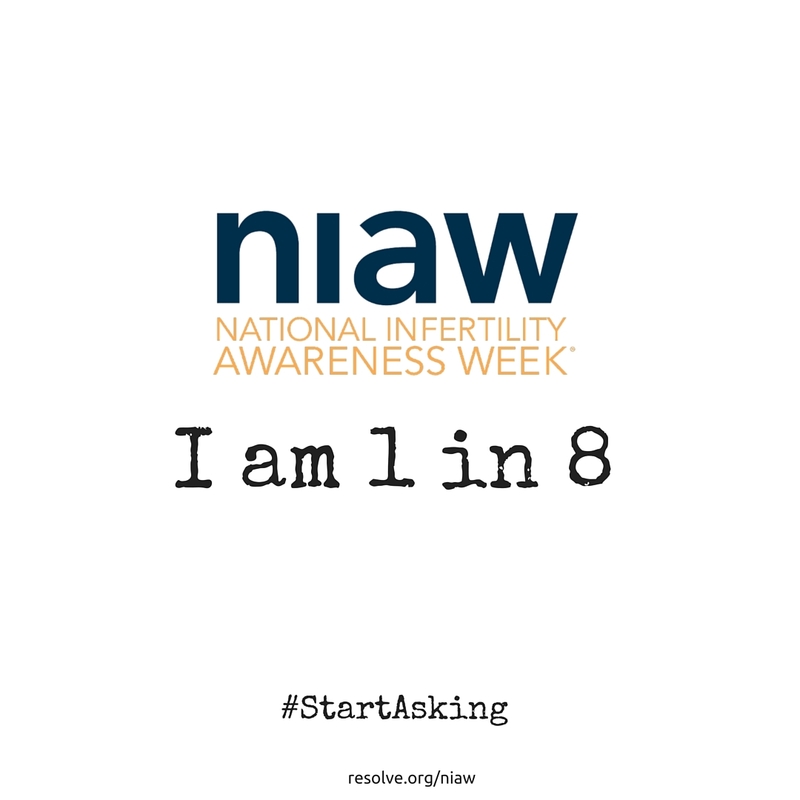 You don't know who is struggling with infertility, you don't know what someone might be going through whether it be a divorce or job change, and when asking someone who is struggling, it is just another reminder that they don't have a baby yet. There are plenty of other conversation starters, stick to those, reproduction is not one of them. To learn more about infertility, Resolve and NIAW, check out the Resolve website. 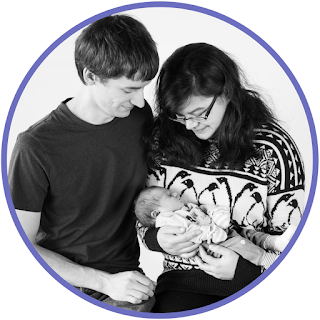 You can also make a donation to Resolve on their website, which will be used to help improve the lives of men and women living with infertility.